How do I use the Kyocera KM1635 copier as a system printer and attach the PC? What's the price of the black toner cartridge and OPC drum for the Kyocera KM-1635 printer? All current prices are shown next to each item on the right-hand side of the page. The drum unit for the Kyocera KM-1635 printer is only available within the Kyocera MK-410 maintenance kit, we don't supply it as a single item. There's a problem with our Kyocera KM-1635 printer. When it's switched on it shows "CALL SERVICE C6000" on the display board of the printer? Unfortunately, we're only a supplier of consumables for the Kyocera KM-1635 printer and we don't provide technical support for printers. Please contact Kyocera directly and hopefully they'll be able to diagnose the error message on your KM-1635 laser printer. We have a Kyocera KM-1635 machine. Now we want your Indian branch address? I'm sorry, we do not have branches, we are an online retailer who only deliver to addresses within the UK. You may wish to contact Kyocera for more assistance. Kyocera KM1635 printers give excellent prints with real clarity. At some stage your Kyocera KM-1635 will run dry of printer toner, and then you'll soon find that fresh Kyocera KM-1635 toner is normally a costly affair. However, you do not need to waste time worrying about shelling out the high costs you'll find on the main street because now at Cartridge Save you can purchase all the Kyocera KM 1635 cartridges you'll want at really competitive prices. Save a lot of money by ordering online at Cartridge Save! Why waste money to buy the KM-1635 original cartridge or KM-1635 compatible toner in the high street when it is much easier to save a load of cash shopping online with Cartridge Save. You enjoy utter confidence by ordering your KM1635 toner cartridges from us seeing as everything is covered by a no quibbles money back guarantee. Keep in mind that every purchase also has free delivery, normally arriving on your doorstep the following business day! 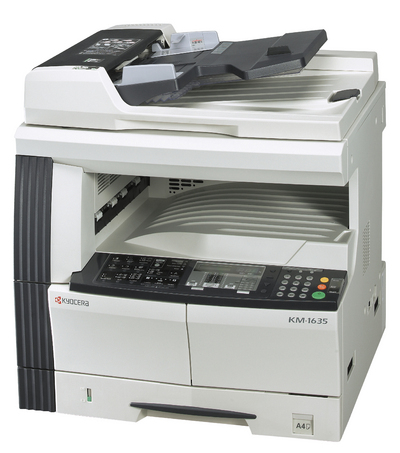 The basic Kyocera KM-1635 is a monochrome digital copier intended for small offices with high-volume printing needs. This unit can deliver a 600 x 600 dpi resolution and it has a monthly duty cycle of 20,000 pages. The Kyocera KM-1635 printer has a warm up time of 20 seconds and can produce the first copy in 5.9 seconds. It can handle media such as transparencies, recycled paper, and envelopes. Printing function as well as the automatic document feeder and duplexer are optional. This copier has a scanner, an output tray, a paper tray, and an organised control panel. The Kyocera KM-1635 black and white copier has a 300-sheet paper drawer plus a 50-sheet multipurpose tray. Copy speed can go as fast as 16 ppm for A4. The KM1635 monochrome laser printer measures 22.6 x 21.8 x 19.8 inches and weighs 86 lbs. The reliable Kyocera KM-1635 photocopier delivers good quality output. This unit has high paper handling capacity; with optional trays, it can handle as many as 1,200 sheets. The Kyocera KM-1635 is very easy to use and setup. This unit can continuously copy up to 999 pages and it offers features such as scan once print many, eco mode, and mixed size processing. Print quality is excellent thanks to the microfine toner contained in the original Kyocera KM-1635 replacement cartridge. The trouble with the Kyocera KM1635 copier is that it only provides basic functionality. The KM-1635 mono laser does not come with an automatic duplexer or an ADF. They must be bought separately. The print function and Ethernet connectivity are also only optional.